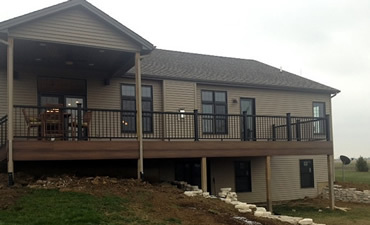 Ruestman Construction specializes in the construction of Pergolas. Pergolas can be built to custom sizes and shapes. Numerous materials can be used in the construction of pergolas. Pergolas provide great shade over outdoor living spaces. Additional features can be added to pergolas like roofs, fans, lighting and curtains. Pergolas are described as giving you that "room" feel to your outside space. Even though it does not have solid walls that would block access to the home and a yard, a pergola creates the intimate space for entertaining.